So sorry for the week long absence. I wore this manicure awhile ago but I haven't gotten around to posting it until now. This week has been incredibly stressful/hectic and I'm so glad that it's almost over. So back when I got Revlon Facets of Fuchsia I also picked up Revlon Starry Pink. I had quickly seen some swatches of the shade online and I was really pleased with Facets of Fuchsia so I assumed that I would enjoy this one as well. However, that was not the case. I couldn't wait to get this colour off of my fingers- something about the silver glitter (which also appeared black at certain times) made it look so dirty. Not a fan. I used Revlon Starry Pink on all fingers except for the ring finger where I used American Apparel L'esprit. On top of that I outlined a shape with a white striping polish and filled it in with Starry Pink. The shape on the ring finger started out somewhat like a DNA double helix (biology geek here), then a slanted infinity symbol (functions nerd, too) but then I decided to mirror the image and now it looks like a butterfly. Hope you're all doing swell! Have you ever had a polish that looked so promising in the bottle/on other people's nails but fails to impress on your own nails? I used American Apparel African Violet and American Apparel Hassid for the ruffian manicure and layered two coats of Revlon Facets of Fuchsia on top of the black. You may notice that my nails are super short. I finally bit the bullet and cut them down. They've been peeling and breaking all over like crazy for awhile now so I gave them a fresh start. Hopefully they grow back quickly because I'm not used to being able to function normally- prying open containers, applying makeup without it getting under my nails, etc :P It's all very handy at the end of the day but I miss having a larger canvas to work on (hence the super tiny purple ruffian). Also, before I had a chance to photograph these, my left thumb nail broke in both corners! I must have been shoving books into my backpack a bit too roughly because now my nail looks more like a talon ): I tried to be stealthy in the photos though and angled my thumb to hide the catastrophe. Anyway, enough ranting from me. Here's the manicure! I used Essie Nice is Nice, Essie Mint Candy Apple, Sephora by OPI Read My Palm and various Art Club striping polishes. The base colour here is American Apparel Factory Grey and the other is American Apparel Summer Peach. 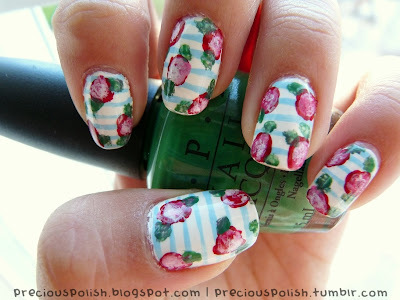 I've seen vintage Cath Kidston-esque nails all over the place for a long time now. It was only until recently that they really sparked my interest though, so I decided to take a try at it! I'm a bit late with the trend but I still really like it. The random swirling for flowers is so simple and looks great from afar (close up, not so much! :P) I decided to add some horizontal stripes just for fun. I used Sally Hansen Whirlwind White as a base colour and Art Club striping polishes for the stripes and the roses. The leaves are OPI Don't Mess with OPI. Here's a little something something for the approaching season! I've done this look before but here it is with autumn appropriate colours. This design truly is versatile for year-round wear. 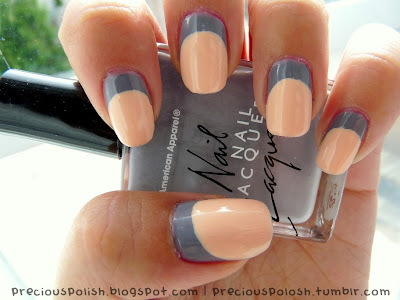 The slanted french tip is super chic and not too bold. Pictured here is American Apparel California Trooper as a base and OPI San Tan-Tonio for the french tips with OPI You Don't Know Jacques for the veins of the leaves. Hi followers! Here's a treat for you all: a video tutorial! I've already done a picture tutorial for this flower technique but I feel that a video is easier to understand and more exciting. I originally wasn't planning on keeping this design on my nails but I liked it so much that I decided to stick with it. 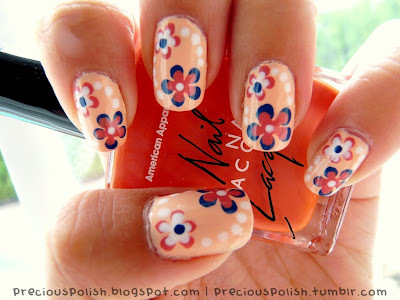 Here I used American Apparel Summer Peach as a base with American Apparel Cameo Blue, American Apparel Rose Bowl and Essence Tip Painter for the details. Is anyone familiar with the new Missoni for Target line? Target doesn't exist in Canada but the collection has been popping up in a lot of magazines. The patterns are super cool and a particular dress design caught my eye. 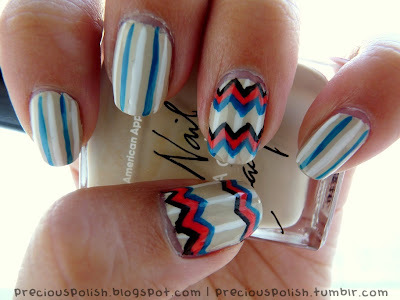 The funky multi-coloured chevron over a striped background inspired me to translate it to nail so here's my take. I think the pattern is really fresh and I'm incredibly pleased with the result. I started with American Apparel California Trooper and a white striping polish for the pinstripes. Then I used a black striping polish, Essence Ocean Breeze and Essence Juicy Coral for the zigzags on the thumbs and ring fingers. As a last minute thought I added stripes in Essence Ocean Breeze to the remaining nails. Here I present to you the product of boredom and ambition. Ultimately, this was a bad idea because I got bored again halfway through and terribly impatient (evident on my little finger ahem...) The thumb came out the nicest and I would be a lot more satisfied if all of the nails came out that way. It was the second nail I painted so I suppose I still had patience and more experience and control on it. Nonetheless I wanted to practice some more line work and a more intricate design. I'm not sure what to call this design. It's a bit tribal and reminds me of a basket weave but I'm not too sure. I don't think I'll be doing this one ever again though so it doesn't really matter. I used American Apparel Cameo Blue on all the nails and a couple white striping polishes because they all got disgustingly thick and goopy.